OK, on with the post! I know, I know... another Charlie's Raw Squeeze post. You are probably sick of them. But I haven't actually been back to Charlie's since this last visit (which was about five weeks ago), so there will be a lot more variety in my upcoming Eating Out posts! Not that there is anything wrong with Charlie's! I just haven't had the opportunity to get back there, but have had opportunities to eat at other very yummy places instead. 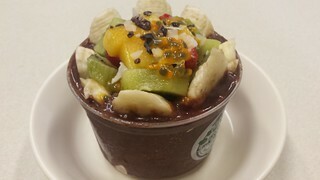 I loved the Superfood Acai Smoothie I had from Charlie's last time, so I decided to try out the Superfood Acai Bowl ($16 large), which has acai, bananas, cocoa, goji berries and coconut water. It did not disappoint, it was very yum! It is a bit squashed here, because they forgot I wanted it takeaway again and had to smoosh a lid on. I definitely recommend this bowl (or smoothie). 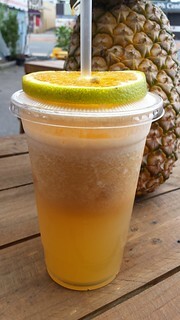 The Tropical Sunrise Smoothie ($10 for large) was a really refreshing drink. It has mango, pineapple, strawberry, mint and coconut water. The pineapple was not too overpowering, and the mint was just perfect. 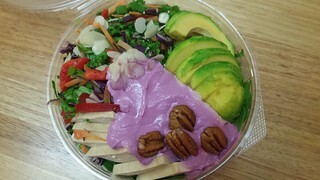 The main reason I went to Charlie's that day was because I wanted to try their new Rainbow Salad ($10.95). Tragically, when I got there, there were none! 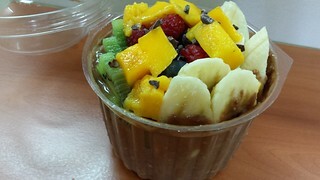 But there was a bit of a wait for my smoothie and bowl, and by the time I got them they had brought out new salads! So I bought one. It has smoked tofu, avocado, a kale and cabbage salad and beetroot cream cheese (similar ingredients to their rainbow salad wraps). I have to say that this one works better as a wrap for me, the salad was nice, but it just was missing something. The falafel black bean kale salad remains my favourite. 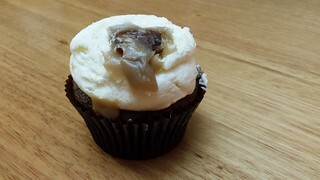 I also picked up a Cloverly Sticky Date Cupcake, which is a bit squished from being put into a too shallow box. This was a good cupcake. I loved the date cake on the base, the icing was not too sweet (as they normally are), and the caramel drizzle on top was a nice finish. It's been a while since I've featured a photo of the handsomest boy Possum, who was my family cat for nearly twenty years. 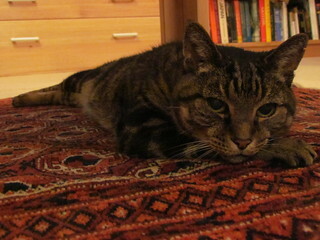 Sadly we had to say goodbye to Possum a couple of years ago. We miss him. I am sure you all agree that he was super handsome. I love bowls. I serve most of my food in bowls. Things just taste better out of bowls. And I love the concept of bowls as a meal as well. Vegan Bowls by Zsu Dever has you covered, with a huge variety of delicious bowls, from grains to sautees to pastas, soups, grilled bowls, breakfasts, salads and more. I have been having a lot of delicious fun with this book! This is one of my newer books, so this is my first round-up from it as well. 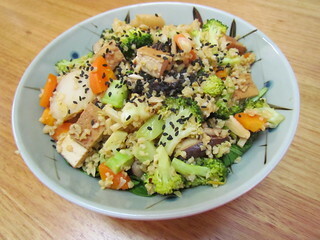 Freekeh Stir-Fry Bowl with Broccoli and Shiitake: Freekeh makes a nice change to rice in this stir-fry bowl, which has lots of vegetables in it as well as the broccoli and shiitake (and yep, I used carrots instead of capsicum). I liked the sweetness of the scallions and the crunch of the water chestnuts in here. 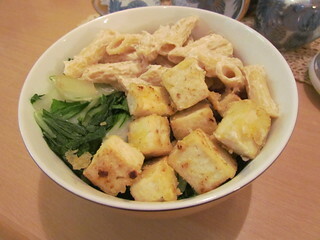 I also added some Japanese-marinated tofu cubes. Thai Panang Curry Bowl: The sauce is so super yum! I used 1 tablespoon of store-bought red curry paste and it was just right for me. Because of my weird coconut fat issues, I used a 270mL tin of light coconut milk made up to 400mL with water instead of a full tin of coconut milk. For the vegetables I used 2 small carrots, a zucchini, a large handful of green beans, some roasted sweet potato, and I also added a tin of chickpeas. 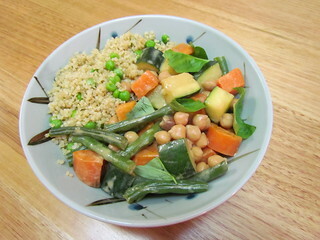 It is served over some lovely pea-studded quinoa. So good. Indonesian Stir-Fried Noodle Bowl: For me this bowl was a little bland and dry, I required a much higher sauce to noodle ration I think! I got three serves rather than four here. As well as noodles it has red onion, broccoli, cabbage, celery, kale and edamame in it, so you will definitely have no issues getting your greens in! Rating: :| ... would be higher with more sauce! Lemongrass Bok Choy and Tofu Bowl: It is pretty hard to explain how amazing this is. First of all, the cashew-based lemongrass sauce is pretty much drinkable on its own. The recipe says to strain the sauce before adding to the pasta, but my blender made it smooth enough for me so I skipped that step. The sauce does thicken up fast! I used 8 oz of penne, rather than 12 oz, but you will definitely need some of the reserved pasta water to thin it out even if you are using slightly less pasta. 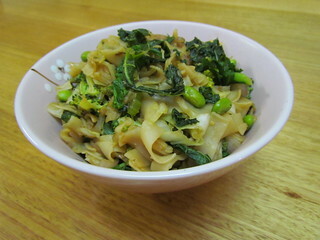 It is then served with some fried tofu and wilted bok choy (I added a smidge of Braggs when I was cooking the bok choy). So very very very good. 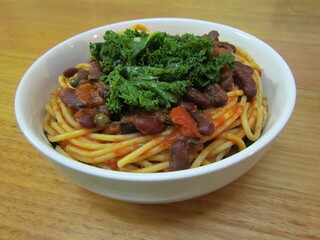 Puttanesca Bowl with Sauteed Kale: I really enjoy puttanesca, it is one of my favourite pasta sauces. This is tasty recipe, with loads of olives and capers and a touch of miso as well. The satueed kale is served on top of the pasta, however I had way more kale that that. So I have kale under the pasta and then a bit on top. I recommend seasoning the kale lightly when sauteeing it. I got 3.5 servings out of this. 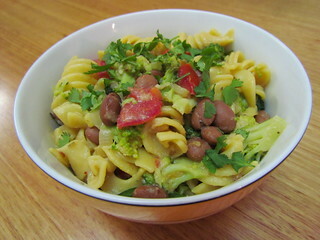 Tex-Mex Pasta Bowl with Pintos and Broccoli: I really liked this one as well. The sauce has masa harina and miso in it, giving it a very distinctive taste, kind of like yummy corn tortillas. I didn't have any chipotle puree, but I just used a teaspoon of chipotle powder and left out the regular chili powder - just right for my sensitive soul.I blended the sauce up with a hand blender rather than whisking. I didn't have any of the option vegan cheese, so I just plonked in about half a cup of nooch. 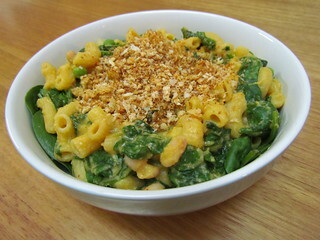 Mac and Cheese Bowl with Spinach and Garlic Breadcrumbs: There is no nooch in this mach and cheese... shocking, I know. But you know what? It doesn't seem to miss it. The sauce is based on cashews, pumpkin, onion and miso. It is meant to have roasted capsicum in it, but I left it out and it was dine. I did add some smoked paprika and a spot of ume vinegar to make it a bit smoky. I had some leftover seasoned panko crumbs in the freezer, so I used these as the base for the breadcrumbs. I only had half a cup, rather than a full cup, but that was plenty for me. 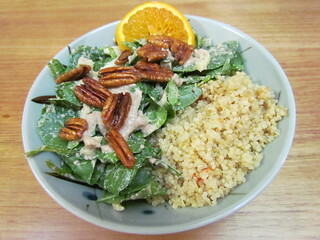 Spinach Salad Bowl with Warm Pecan Dressing: I decreased the oil in the dressing here by using water with a pinch of broth powder and guar gum to thicken it. The dressing, made with ground up toasted pecans, is quite sweet. I liked the savoury quinoa and the fresh fennel to counter act it. I also served this over some leftover roasted sweet potato. 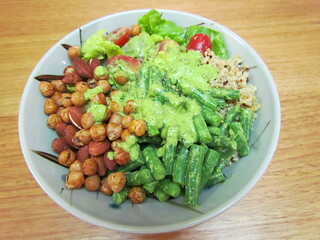 Two-Bean Salad Bowl with Pesto Dressing: The two beans here are green beans and chickpeas, and the chickpeas are cooked with almonds and spices to become quite the tasty treat. The pesto dressing is tahini based, making it rich without being too oily. It is very fresh and tangy. I got two servings out of this using half the quinoa but a full batch of the rest of the ingredients. 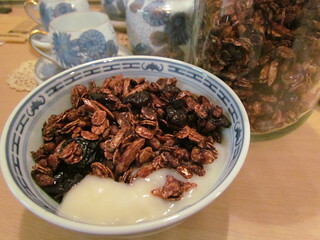 Chocolate Cherry Granola Bowl with Almonds: This was the first time I had actually made granola... what took me so long? Chocolate and cherry is one of my favourite combinations, so I always knew I would like this. I loved it! I used St Dalfours cherry jam as the 'fruit spread', which had whole cherries in it... I am not sure if fruit spread is meant to be smooth? I kept it in the fridge after I made it in case the whole cherries went yucky. Dried cherries are hard to come by and expensive here, so I used a half and half blend of cherries and cranberries. This was delicious as a cereal, and also very snackable! Do not be alarmed. This is Boe, the bow-tied Burm. 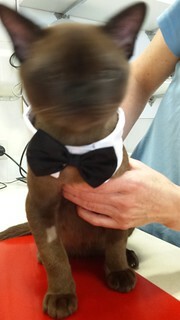 He is so devastatingly handsome, that for your own safety we had to blur his face. 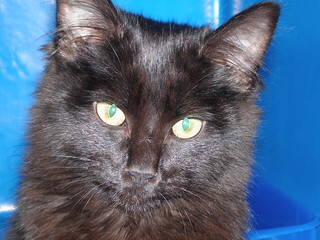 Or he is such a silly non-stop kitten, he wouldn't keep his head still. One of those two things. Yep, more Charlie's. I was filling in for someone at our smallest clinic, and it was a quiet day, and that clinic is even a bit closer to Charlie's than my regular clinic, so off I went! You can see the other things I have had from Charlie's here. I picked up the Liquid Gold Juice (pineapple, pear, lemon, apple, $7 for large) for one of the nurses, who said it was good though it was hard to pick the other flavours over the pineapple. For my smoothie I had the Superfood Acai Smoothie (acai, frozen banana, cacao, goji berries, dates, almond milk, $10 for large) and it was amazing! 10/10 would recommend. I also had the Blended Peanut Butter Bowl (cacao, peanut butter, banana, coconut water, $15 for large), which was nice but needed more peanut butter. I am a peanut butter fiend and require large amounts of peanut butter to be satisfied. 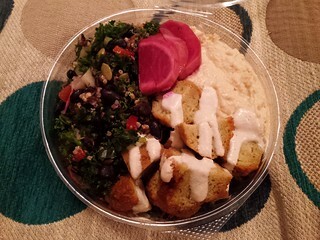 I got my favourite salad to take home for dinner the Black Bean, Kale and Falafel Salad. This is so good, even though I have to pick little bits of capsicum out of the kale. I also picked up a Cloverly Cupcake White Forest Cupcake. 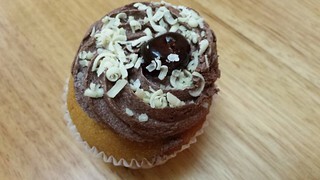 This was a vanilla cupcake with black cherry jam filling, chocolate buttercream, shaved white chocolate and a cherry ($5.50). I wish there was more filling! 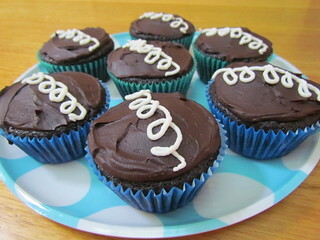 The icing tasted oddly minty, so I am not sure if there was some strange cross over issues somewhere down the track. A nice cupcake, but I definitely prefer a traditional black forest style more. 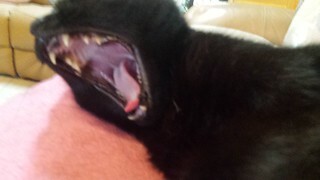 Motion shot of Dim Sim yawning. She has such a fabulous pink tongue! 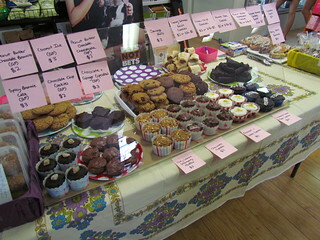 A few weeks ago I organised a bake sale for Animal Lib Queensland. I've organised many many bake sales before, through my vegan bake sale group Eating For Animals. I have been trying to become more involved with ALQ in a way that suits my strengths, and when it comes down to it my strengths are baking and doing bake sales. This was by far the biggest and most successful bake sale I have organised to date though, the ALQ supporters were amazing in their turn out. The baking was mostly done by me and by Bec, who is the Campaign Director for ALQ, and by a few other members of ALQ as well. The sale was held at The Green Edge, Brisbane's vegan grocery store. They are wonderful at making space available for groups to hold bake sales for fundraising. 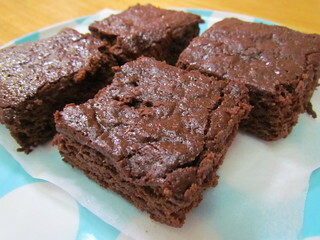 Berry Patch Brownies from Let Them Eat Vegan by Dreena Burton: I have just realised that I have never posted about these on this blog... which is outrageous as this is the recipe I have made most from any of my cookbooks ever! These are in serious demand at bake sales (or for any other reason you can think), and always sell out fast. 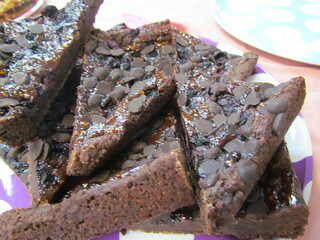 A dense and chocolately brownie base with a topping of raspberry jam, blueberries and chocolate chips. They are SO GOOD! I like to cut them into big triangles for bake sales, because you want your brownie to be super special! Beetroot and Lemon Cupcakes from The New Vegan by Aine Carlin: These are beautiful, with a gently beet flavoured cupcake and a zesty lemon icing. I made a double batch of cupcakes, but just a single batch of icing, and the ratio was perfect for me. The batter was beautifully pink, but baked up dainty and pale. This is very different from the dark red cupcakes in the photo in the book, but Aine said that her vary in colour a lot between batches depending on the beetroot. Peanut Butter Butterscotch Cookies from The Vegan Cookie Connoisseur by Kelly Peloza: I have a serious stash of butterscotch chips from the US that I need to use up, and these cookies were perfect. They go nice and crunchy, and the combination of peanut butter and sweet butterscotch was great. 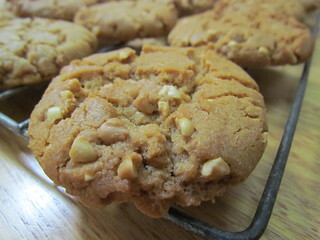 I didn't have butterscotch extract, so I used maple instead (not the same I know, but kind of close), and I mixed in chopped peanuts and butterscotch chips as my add ins. Chocolate Ginger Gluten-Freedom Cupcakes from Vegan Cupcakes Take Over The World by Isa Chandra Moskowitz and Terry Hope Romero: This chocolate gluten freedom cupcake from this book is my standard go to gf cupcake base. 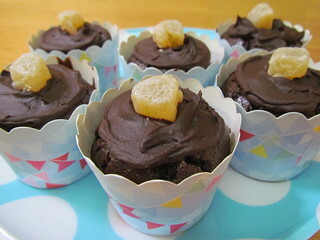 For this time I followed the instructions for the Chocolate Ginger variation of the regular chocolate cupakes in the book, adding in ground ginger and chopped crystallised ginger. I topped with chocolate ganache and added a piece of ginger on top. Hidden Treasure Muffins from Whole Grain Vegan Baking by Celine Steen and Tamasin Noyes: These are lemony muffins filled with jam (I chose strawberry) and topped with a strusel. I made a couple of subs, using brown sugar instead of sucanat and soy milk instead of refrigerated coconut milk. This has a lot of lemon in the batter - juice, zest and 20mL of lemon extract. 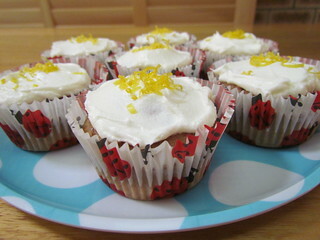 I ran out of lemon extract at 15mL, and only had a little bit of zest, but they were still very lemony. These had a very thick batter. 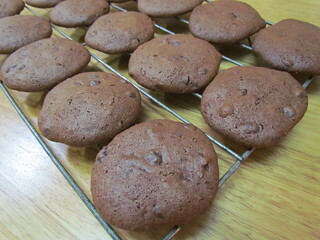 Orange Double Chocolate Cookies from 500 Vegan Recipes by Celine Steen and Joni Marie Newman: I had managed to acquire two tins of vegan condensed milk, which I am not a fan of, so I wanted to use it all up for this bake sale. I used one tin to make a half batch of these, which made 15 cookies using an Australian TBS as the scoop. The dough is very soft, so I chilled it a little bit before making it into cookies and baking. My orange ended up being mouldy, so I didn't have any orange zest to add, and the orange extract didn't really come through very strong. These were a soft and sweet cookie. Gluten-Free Spicy Brownie Cake from 500 Vegan Recipes by Celine Steen and Joni Marie Newman: This is a very soft brownie cake based on rice flour that has a nice, subtle spiciness to it thanks to a host of different spices, including white pepper. I had to bake this an extra 15 minutes to get it to fully set all the way through. 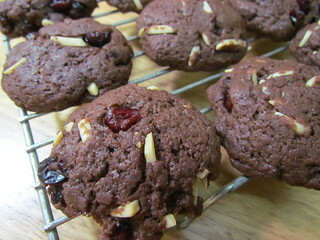 Chocolate Cranberry Almond Oops Cookies: Remember I said I made a half batch of those double chocolate cookies? That was all fine, until I accidentally added the full amount of flour and sugar to the rest of the half batch dry ingredients and had to start again. So the accidental mix I turned into these cookies with the suggestion of a friend as to potential ratios. I added too much oil, and had to blot the batter a lot, but they actually turned out OK. I added cranberries and almonds to them. 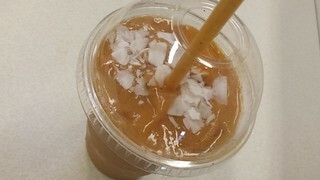 Coconut Ice: To use up my last tin of soy condensed milk, I used this recipe. 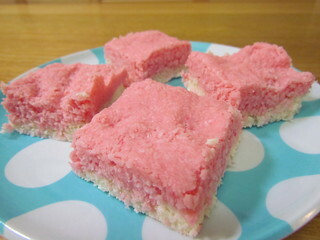 I also added some strawberry extract to the pink layer, to make it a strawberry coconut ice. I am not a big coconut ice fan, but apparently it was well recieved! I also made a batch of Soulhaus Cookies from Great Gluten-Free Vegan Eats by Allyson Kramer, another thing I always bring to bake sales, which I have blogged about here, as well as some sausage rolls. It was so busy, I didn't have a chance to take photos of everything else that people brought. 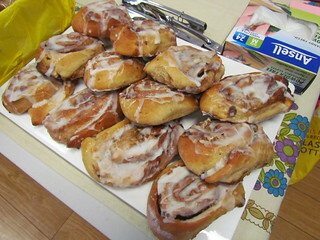 But here is a photo of Bec's famous Cinnamon Snails, as well as the table itself. Afterwards we stayed for lunch at The Green Edge. 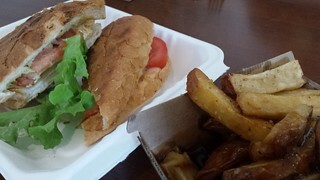 Bec had the Satay Burger and I had the Avocado, Tomato, Ham and Cheese Toasty, and we both had the gravy chips. As I mentioned, it was a huge day. The bake sale was scheduled for four hours, but we had sold out of everything within two hours. I have never seen anything like it! All up, including sales and some generous donations, we made just over $1700, which is the most of any bake sale I have ever done. This money will be used to help ALQ's anti-greyhound racing and ditch dairy campaigns, as well as their other work. I'll be doing another bake sale at the end of April with Eating For Animals for the World Wide Vegan Bake Sale. 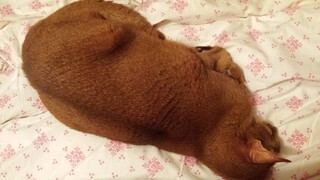 I was washing my sheets and had my doona folded up on the floor at the foot of the bed, and of course Sahara decided that this was the perfect spot for some serious slumber. Towards the end of last year, when I lifted the great cookbook ban of 2015 (I was saving for my US trip), this was one of the first new books I bought. The Great Vegan Protein Book shows you exactly where vegans get their protein. 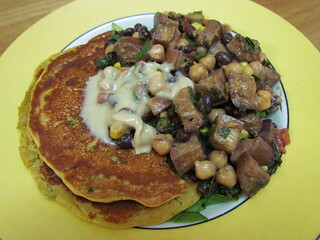 It is split into four sections: beans, nuts/seeds, tofu/tempeh and seitan. This is the first time I have done a full round-up for this book, so let's see what I've done! Pudla and Eggplant Balela: This was a great combination. I have seen pudla popping up in many cookbooks and blogs lately, and have been enjoying trying different once, but this is hands down my favourite. It is just super delicious and savoury! I failed cookbook reading 101 with the balela and somehow, even though I read through the recipe four times, didn't notice until that afternoon that it was meant to chill overnight, so it was only marinated for four hours. It was still really good though, and the leftovers were even better! Instead of marinating, roasting and then dicing sliced eggplant, I just marinated and roasted diced eggplant. I also realised I was out of white balsamic, so I used a mix of regular balsamic and water, and I summed corn kernels instead of capsicum. I served it all with a drizzle of tahini. 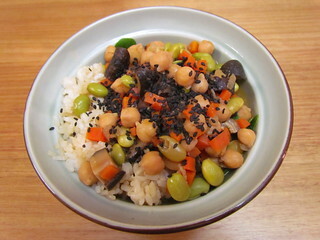 Sushi Rice and Bean Stew: This was like a nice miso stew or soup, but I felt it just needed a little something extra to really take it to extra yummy. I loved the sushi rice component of this recipe, it is a very handy recipe to have. I chopped up the mushrooms from the mushroom soaking broth and added them back to the stew, because you can never have too many mushrooms. 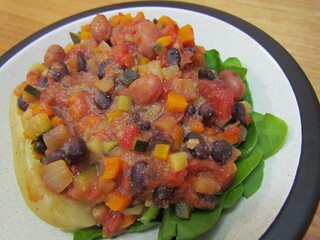 Giardiniera Chili: This is a very yummy chilli, packed with veggies and beans and nooch. Yum! I served it over baked potatoes and baby spinach and topped it with avocado. The recipe says it makes 8 servings, but I got 5 out of it. 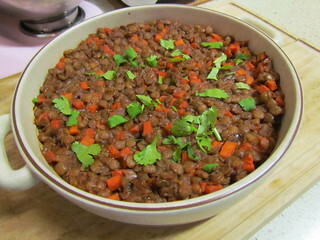 BBQ Lentils: This recipe uses a quick homemade BBQ sauce, that I found to be quite sweet. Next time I would cut down on the maple syrup. It is baked in the oven and makes the kitchen smell like a happy place! This recipe says it serves 8-10, I made a half batch and got 3 serves out of it. Wild Rice Pilaf with Spicy Cashews: The cashews in this recipe are so tasty, you could just make them as a snack on their own. They coating is a bit clumpy, but means it is full of flavour, though it did wash off and dilute down in the pilaf a little bit. 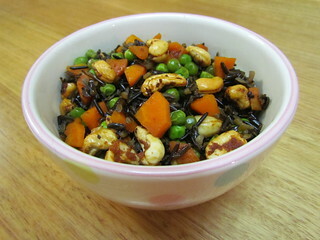 Overall, this dish was quite sweet, but has a nice combination of textures with the crunchy cashews and chewy wild rice. 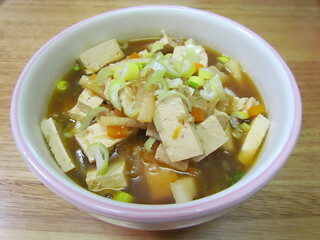 20 Minute Tofu Soup: I was feeling pretty sick one day, so I made this yummy vinegary soup to help me feel better. And it did. I don't have a lot of different chili sauces lying around, so I used sriracha rather than sambal oelek. This said it makes 3 to 4 servings, but I had a cold to feed and got one and a half servings out of it. 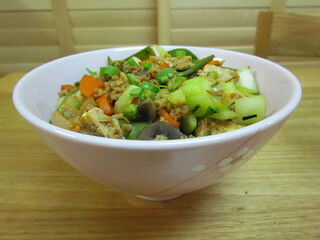 Tofu Fried Rice: This was a bit meh, I could have done with more flavour. I subbed snow peas for sugar snap peas and carrots for capsicum, and also had extra bok choy. I didn't use the bean sprouts because I can only buy them in large bags and they always go off before I can use them again, so I skipped them. Well-Dressed Tofu Bowls: Yes and Yum. 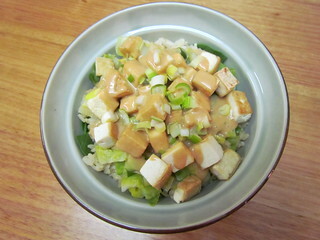 Sushi Rice (from the above mentioned Sushi Rice and Bean Stew) with sauteed tofu cubes and Brussels sprouts and a yummy peanut sauce... what is not to enjoy here? My mum thought the sauce was a bit too vinegary, but I had no issue with it (I do love vinegar). 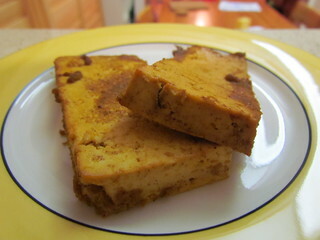 Caribbean Tofu: I made this as a mixture of both slabs and cubes for different uses. 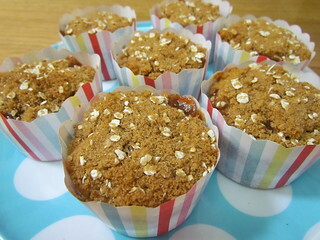 It is tasty, though goes quite soft when baked in the liquid as the recipe instructs. I only used half the amount of mild curry powder because I don't like things to get too hot! 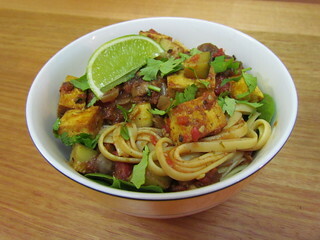 Caribbean Tofu and Pasta: The cubes of the above tofu I used for this pasta dish. I only used 8 oz of pasta (rather than 12), which makes for a chunky sauce to pasta ratio and four servings. I left out the capsicum and jalapeno, and again only used half the amount of mild curry powder called for. Oh my gosh! Somewhere new to share with you! OK, Su Life isn't actually new at all. I get takeaway from there all the time. Su Life used to be known as Huo Fo, and was literally five minutes from my house. Then they closed for a while and reopened as Su Life, about 10 minutes from my house. 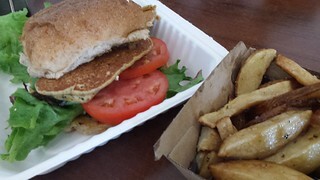 As mentioned, I get takeaway from there a lot, but I don't often actually eat there. One Sunday, after mattress and food processor shopping, Mum and I decided to stop by for lunch as it was just around the corner. Unfortunately their menu isn't online, so I don't have prices to hand. Su Life has an extensive list of drinks. 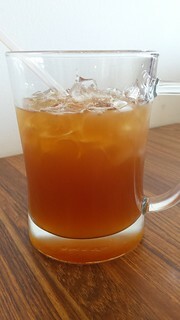 It was a hot day, so I got this Plum and Kumquat Iced Tea, which was very refreshing by very sweet! 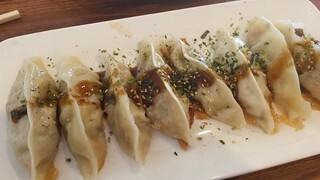 A must for any visit to Su Life is their Pan-Fried Dumplings, which are exceptionally yummy and have a great sauce on them! Mum ordered her favourite, Spicy Crispy Chicken. This is a pretty famous dish around Brisbane. 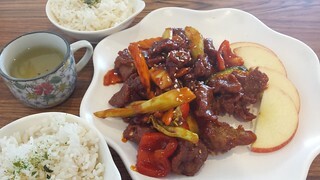 The mock chicken is crispy and it is in a sweet and spicy sauce. Sometimes it is spicier than others. I like to nibble on a bit of this, too much and it gets too spicy for me. 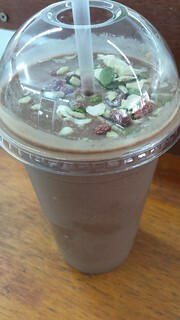 But it also has celery and cashews in it, which are my favourite part. It is pictured here with the rice and green tea we also got (how cute is the tea cup?). 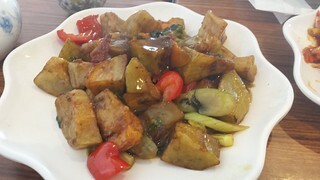 I decided to try something new, and went with the Eggplant in Veggie Oyster Sauce. I obviously picked out all the capsicum. When this dish was hot, it was really really yummy. Though the eggplant went a bit funny as it cooled down. Probably better for sharing so everyone can gobble it up while it is still steaming. 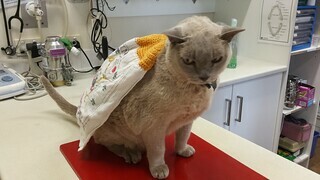 Flashback to Pepper, the first kitty I ever speyed back in vet school.